This course is designed to help you become familiar with types of dependent adult abuse, how to identify them, and what to do if you suspect dependent adult abuse. This course is specifically geared toward Iowa state laws on dependent adult abuse and neglect. You will learn what it means to be a mandatory reporter in this state, and become familiar with specific instructions for reporting suspected abuse. You will also be well-informed about how a case may be handled after a report has been made as well as Iowa-specific resources related to dependent adult abuse. 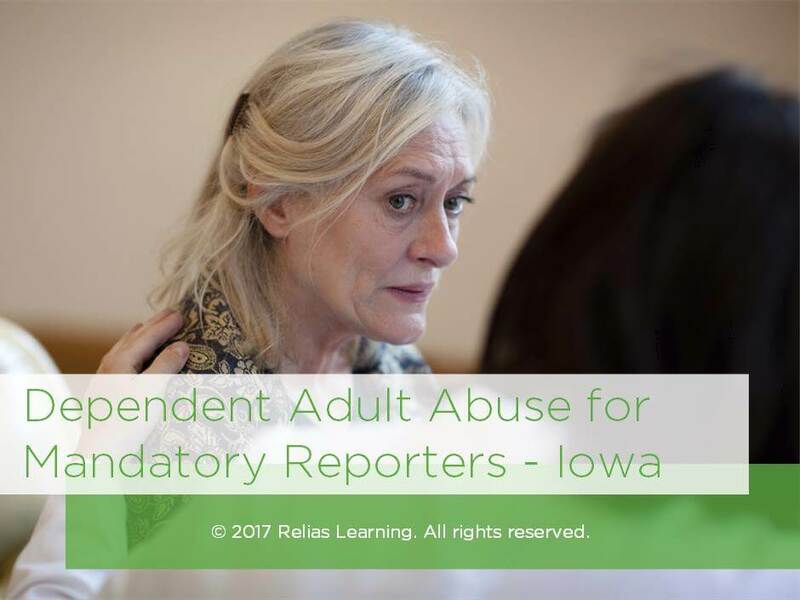 This course will help you understand your responsibilities as a mandatory reporter, and guide you through the procedures for identifying and reporting abuse in the state of Iowa. Identify several types of dependent adult abuse. Describe reporting requirements and procedures. Recognize 5 physical, behavioral, and environmental indicators of abuse. The target audience for this course is: entry, intermediate, and advanced level General Staff; in the following settings: All Healthcare Settings.